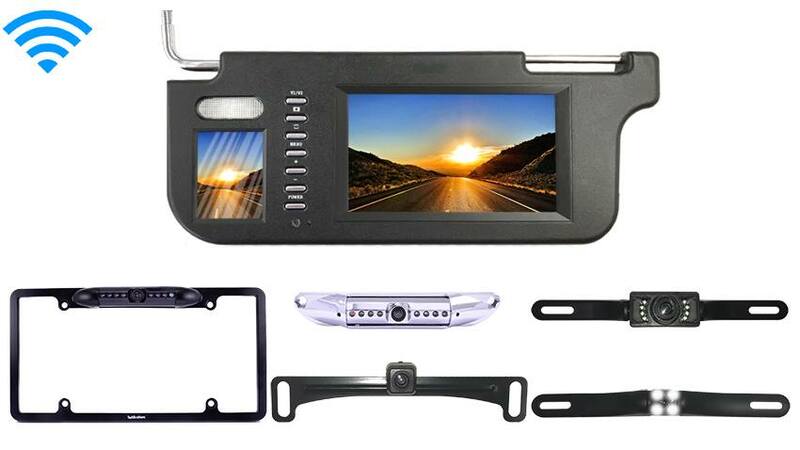 This crystal clear 7” LCD Visor Monitor is a perfect addition to any driver that needs assistance backing up. See the whole world behind you in rich colors. It is also an LCD monitor built onto a Visor so it takes up no extra space. In addition, it has two video inputs so you can connect a camera and a game system or DVD player. This monitor is compatible with all our cameras and any car; it connects to any power source or a cigarette lighter. Super easy installation and it comes in three colors Black, Gray, and Biege. This Wireless License Plate camera is mounted by screwing your current license plate screws through its brackets; it’s a very simple installation. Has optimal reception for up to 70ft this allows it to work perfectly without interruption in any vehicle. The camera can also be adjusted by angling the camera up or down so you can get the perfectview for your car. There is no need to drill any holes or install mounting brackets. The camera has a 120° angle which is best for Cars, SUVs, and Trucks. With 120° everything behind the vehicle can easily be seen, it is also color, waterproof and has military grade night vision. The camera is also durable for use in the roughest weather conditions.